Kuala Lumpur, Malaysia -- DRU-GU Choegyal Rinpoche, like most of his previous incarnations, is a highly gifted and well-known artist. << Most of Choegyal Rinpoche’s paintings are untitled and have one thing in common: the Buddha’s vision expressed in the tantric teachings that everything is living light energy, a living universe of all the fantastic wonders of the mind. The Tibetan Buddhist master’s widely exhibited paintings are known for their vibrant immediacy of expression. His works display a mastery over a broad range of styles, from the ornate precision of the traditional thankas to impressionistic evocations of meditative experiences. His creative works also include sculptures and carpet designs. He founded Dru-gu Unique Tiger and Snow Leopard Carpets in cooperation with a Tibetan artisan community of carpet weavers near Tara Bir. His high quality limited edition carpets can be found in museums and private collections. Choegyal Rinpoche engages in a wide range of media, from painting to calligraphy, drawing, carpet designing and sculpting.His art themes are based on multiple subjects including the mind, experiences, lineage masters of all Tibetan Buddhist schools, landscapes, illustrated poetry and songs, and calligraphy. His current art series includes an illustrated series of Bardo teachings, illustrations of Tibetan life before 1959 and Tibetan life in exile, and reflects the Tibetan Buddhist's attitude towards women. 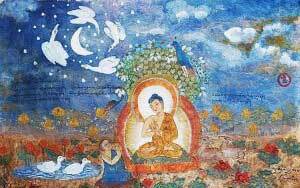 Choegyal Rinpoche started painting as a hobby. He was especially fascinated by the thankas and spiritual art. During his early years in India where he had sought asylum at the age of 13, he was very homesick and produced artworks based on his fond memories of earlier times. He also recreated from memory, some of the great thankas, deity paintings and artistic treasures which were destroyed in the cultural evolution. “With brush and colours, I let everything flow and move without effort. These paintings differ from traditional works as they do not originate from a plan or concept. 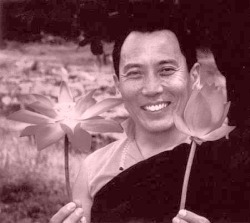 In this process, there is no judgment and no modification,” he said in his website, choegyalrinpoche.org. Some of his works are created using elements of both traditional and spontaneous methods. Although his works differ in style and technique, they have something in common, he said. DRU-GU Choegyal Rinpoche was born in 1946 in the Province of Dru-gu in Kham, East Tibet. While still in his mother’s womb, he was recognised by the 16th Karmapa and other high Tibetan masters as the eighth reincarnation of Dru-gu Choegyal Gyamtso of the Drukpa Kagyu lineage. He was enthroned at the age of four, and was trained by the eighth Khamtrul Rinpoche, one of the greatest artists from Tibet and a meditation master. He also studied under other Tibetan masters. In 1959, at the age of 13, Choegyal Rinpoche sought asylum in India, joining his guru, the eighth Khamtrul Rinpoche. Many monks and lay followers from Eastern Tibet rallied around Khamtrul Rinpoche and formed a refugee community in Kalimpong. The community later moved to the Kangra Valley in the high country of Himachal Pradesh, and later to Dalhousie, and then their present location at Tashi Jong. Choegyal Rinpoche served the Tashi Jong community for six years (1988 to 1994), first as vice-president, then as president. Presently, he is the spiritual head of the Dru-gu region of Tibet and the Dru-gu Monastic Institute. He is also vice-president of Jangchub Jong Buddhist Institute. He has travelled extensively throughout the world to teach the Dharma, exhibit his art and promote his projects. Since 1994, he has been championing the restoration of traditional art and culture, and working towards improving the standard of living of the Dru-gu region. His artworks have been exhibited in Europe, Asia, and North and South America. The proceeds from his work are used to support his projects in Tibet and Nepal. Dru-gu Choegyal Rinpoche’s works are showcased in his exhibition Beautiful ... Spiritual ... Mind from now till Jan 25 at the Metro Fine Art (ground floor) of Legend Hotel Kuala Lumpur. The exhibition is open daily from 11.30am to 5.30pm, except Sundays.